Schoharie County and the county seat, the town of Schoharie, both derive their name from a Mohawk Indian word which means "floating driftwood." 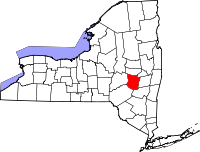 The county was formally established in 1795, and was one of a great number that initially began as a part of the vast Albany County. The Schoharie County Historical Society, which has been active for over 120 years, operates their Old Stone Fort Library at 145 Fort Road in Schoharie, NY. The Library contains a massive amount of records and information, among which are census records dated for every decade from 1790 to 1925, obituary records from 1828 to 1879 and again from 1939 to 1964, a death index also dated from 1939 to 1964, family histories and genealogical charts, historical newspapers, and much more. Usage of the library and its holdings is free for Society members and $6 per day for nonmembers.